Ubisoft and New Regency are hard at work to get the film released ASAP. Considering how many videogame movie adaptations get stuck in development hell (Halo, anyone? BioShock? Uncharted? ), it's probably a good thing that Ubisoft recently took action to make sure the Assassin's Creed film is still on schedule. The French developer has teamed up with New Regency, a film production company with quite a few major titles under its belt, to ensure that its Michael Fassbender flick releases in a timely manner. 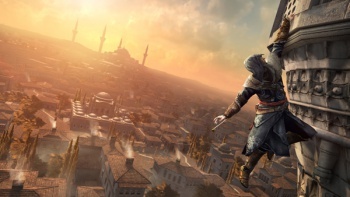 Working together, Ubisoft and New Regency hope to "fast-track" the film. True to their word, the two companies have indicated that a screenplay is already in the works. "Ubisoft chose to partner with New Regency because they are a talent and filmmaker-driven company, with the same independent and creative mindset that we have at Ubisoft Motion Pictures," says Jean-Julien Baronnet, the CEO of Ubisoft Motion Pictures. The companies have not yet announced a solid release date for the movie, but given New Regency's deserved reputation as a prolific and experienced production company, the project should start moving along at a brisk pace. Baronnet's assertion is correct: New Regency has some impressive titles under its belt, including Man on Fire, Fight Club, and, oddly, Terry Gillam's Brazil. However, most of its titles have been mid-budget pieces like Mr. and Mrs. Smith and Marley & Me. Naturally, it's also produced its share of questionable titles, including Meet the Spartans and the Alvin and the Chipmunks trilogy, so the quality of the Assassin's Creed film will largely depend on the talent New Regency acquires for screenwriting, directing, and acting. There's no guarantee that the Assassin's Creed film will be good, but with New Regency taking part in its development, there's at least a good indication that it will come out sooner rather than later. Prince of Persia, another Ubisoft series, had one of the best videogame movie adaptations ever, clocking in at "fairly inoffensive." Perhaps it's time to raise the stakes and bring Assassin's Creed firmly into "mostly watchable" territory.